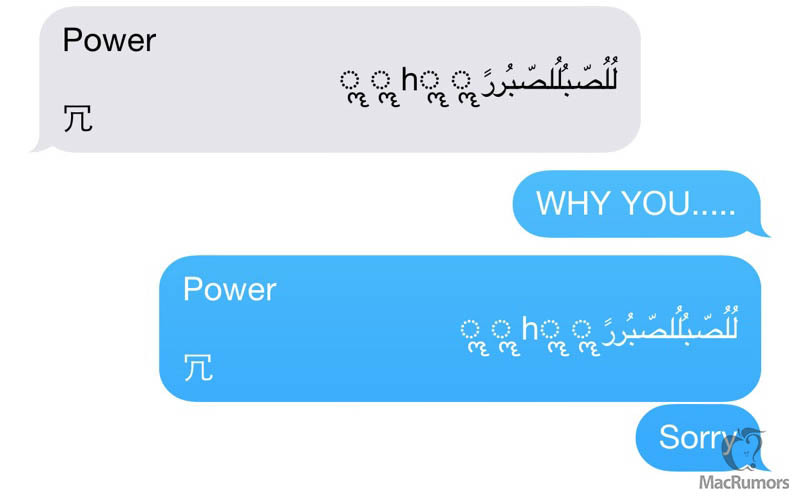 Apple seeded the fourth beta of iOS 8.4 to developers yesterday with a fix for a messaging bug that causes an iPhone, iPad or iPod touch to crash after receiving a specific string of Unicode characters via iMessage or SMS (via HDBlog.it). The bug also affects the Mac and Apple Watch and extends to third-party messaging apps such as Snapchat, Twitter and WhatsApp, as the issue is tied to the way banner notifications process Unicode. Sending the string of characters to an iPhone, iPad or iPod touch results in an immediate respring, causing the device to crash and quickly reboot. From there, if the Messages app was opened at a list view, the Messages app crashes automatically when you try to open it. If it was opened to the conversation where you received the message, the app will open, but attempting to go to another conversation causes Messages to crash. Apple recently published a support document on its website with a temporary workaround for the problem, and ensured that a permanent fix would be issued in a future software update. That fix has arrived in the form of iOS 8.4, which will be released ahead of Apple Music's launch on June 30. In the meantime, affected users can ask Siri to "read unread messages" and use Siri to reply to the malicious message in order to regain access to the Messages app and delete the message. This bug is just so terrible. At least everyone's devices will be usable on the 30th. If you have friends sending you that message, you don't need an update. You need new friends. downloaded and confirmed. this weird text string does not crash my phone. Let's wait to see what new creative text string someone comes up with? It's definitely going to be a combination of words that would never be used in the same sentence. "Purchase new Blackberry phone" would be a good one to try. I'm surprised that they chose to implement this in 8.4 rather than releasing a small update right away. God forbid high school students would have to put away the phone and talk to somebody face to face. So... Where is 8.3.1??? Today maybe?